La La Land is one of the most different and entertaining movies of recent times I have ever seen. The acting and the melodious musical numbers mesmerized me. The colorful setting and dresses also add to the cinematic flair. 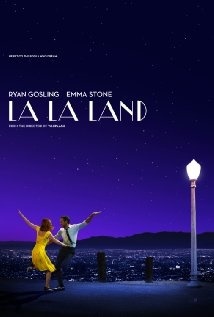 The story is about two aspiring people with dreams of what they want to become, Sebastian (Ryan Gosling) and Mia (Emma Stone). Sebastian is an exceptional jazz pianist who wants to revive jazz with his own jazz club which he dreams to make and Mia dreams to be an exceptional actress. The two meet under random circumstances, somewhat rudely. Drawn together by their aspiration to do what they love, they fall for each other. However, their dreams conflict with their love for each other. Ryan Gosling excellently expresses his love for jazz and Mia. He enacts the piano playing part exceptionally well and it really looks like he is a gifted jazz pianist. Emma Stone is a show stealer as Mia with her expressive eyes, aspirations and acting skills, especially during the scenes where her character auditions and her chemistry with Ryan Gosling is amazing. John Legend, as Keith, utilizes his short on-screen time well, portraying a man with a different taste in jazz which Sebastian doesn’t like, and he happens to be a good friend in need. Damien Chazelle’s direction keeps the movie flowing from one beautiful musical number to the next. Mandy Moore’s exceptional choreography charms us, particularly in “A Lovely Night,” which was done in one-shot on a hilltop on Sunset, and includes amazing dancing from the main actors. My favorite scene is the scene in the planetarium with creative visuals such as Sebastian and Mia flying in the sky, dancing. Sebastian and Mia’s dresses in the movie are spectacular and some of the best I have seen in a movie. The film is also shot in cinemascope which gives it the vibe of many golden Hollywood musicals. The movie has a positive message about Mia and Sebastian never giving up their dreams. Despite multiple failures, Mia still pursues her dreams about being an actress and the same with Sebastian about starting a jazz club. I give this movie 5, out of 5 stars and recommend it for ages 10 to 18. The only inappropriate thing about the movie is some of the language, but that is infrequent. This is a movie which everyone will enjoy. This film opens in theaters on December 25, 2016, so go and check it out for a unique musical unlike any other.